Fiber-reinforced repair cementitious mortar of controlled shrinkage. It presents strong adhesion to the substrate and develops early mechanical strength. 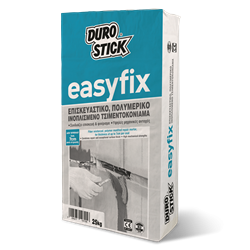 EASYFIX is ideal for repairingand smoothing concrete elementson both horizontal and vertical surfaces. Suitable for filling concrete defects on floors, walls, and roofs. Also suitable as coving mortar for roofs etc.Classified PCC R3 as concreterepair product, per EN 1504-3.